There is so much beauty and power in simple human connection. Dance has the ability to connect and bring together a multitude of individuals and cultures. There is so much beauty and power in simple human connection — regardless of age, ethnicity, gender, or culture, dance and movement can heal and bring joy to all. Dancing is a holistic art form available to people of all ages, backgrounds and abilities. It has the power to enhance one’s innate creativity, authenticity and courage. Melissa Panetta: Deep Roots is a dance ceremony that honours the ancestors and brings hope to generations past, present, and future. Can you elaborate on this and explain your inspiration throughout your creative process? Desirée Dunbar: This production weaves together my passions of both dance making and healing work. I strive to empower others to release deeply help held energy on their path to living a happy and healthy life. I have the pleasure and honour of being in the studio weekly with professionals, emerging professionals and elder community dancers and in Deep Roots I’ve brought together an intergenerational cast to tell the story of our ancestors. At the heart of this 60 minute production is the intention to honour our ancestors and send healing to the past so that all the generations may thrive. I believe that the stories of our ancestors reside in one’s DNA and that by giving them a voice through spontaneous gesture, we gain new awareness that allows one to be their authentic selves. Since completing my Masters of Fine Art from the University of Arizona in 2012, I have developed a method blending authentic movement and Energetic Neuro-Linguistic Programming to connect one to a deeper layer of the mind not normally accessible. The movement method helps surpass superficial desires, attitudes and beliefs and discover where inner resolution is needed. Powerful examples of personal reconciliation through this project include dancer Linda Rosenheck’s experience of translating letters from 1931 from a correspondence between her uncle in Poland and grandmother in Winnipeg shortly before he died in the Holocaust. He wrote in anguish of the immense personal, familial and cultural difficulties of the time. The ensemble then brought healing and closure through authentic movement processes that resulted in a greater inner peace for Linda. Another example is Garrick Jang’s story of growing up as a Chinese immigrant in the local Strathcona neighbourhood and having a mother who, against many odds, achieved great career success. Through the process, Garrick had profound realizations of the loving bonds between his mother and father and the understanding that his mother did not want him to miss out on the enjoyment in life as she felt she had. He also traced his propensity for theatricality to his Grandfather who brought Chinese Opera acts over from China to Vancouver Chinatown. Linda and Garrick’s stories are embodied and shared within Deep Roots in the hopes that universal theme of connection will shine through. We have also invited audience members to submit family stories that they would like a healing for and we will be choosing one per performance to dance as a structured improvisation. Melissa Panetta: One of the many aspects that I love about Dezza Dance is how the work is so multi-faceted. I remember dancing in your company and loving that we were able to work with all kinds of artists exploring all art forms. Dezza Dance is a full interdisciplinary experience in the best way possible and this piece is no different! Deep Roots incorporates many different individuals including professional dancers, intergenerational community artists, as well as musicians. What was it like working with such a wide dynamic group and what was the interaction like amongst all? We are never doing anything alone. When we honour the ancestors and send healing to the past we bring new hope to all the generations. Desirée Dunbar: Having an ensemble with varying backgrounds and of different ages means there is a plethora of youth and wisdom in the room. The young dancers learn from the lived experience of the elders and the elders are completely inspired by the sheer physical prowess of the young dancers. It is a wonderfully supportive and uplifting atmosphere. Whenever possible I collaborate with musicians to co-create new work. 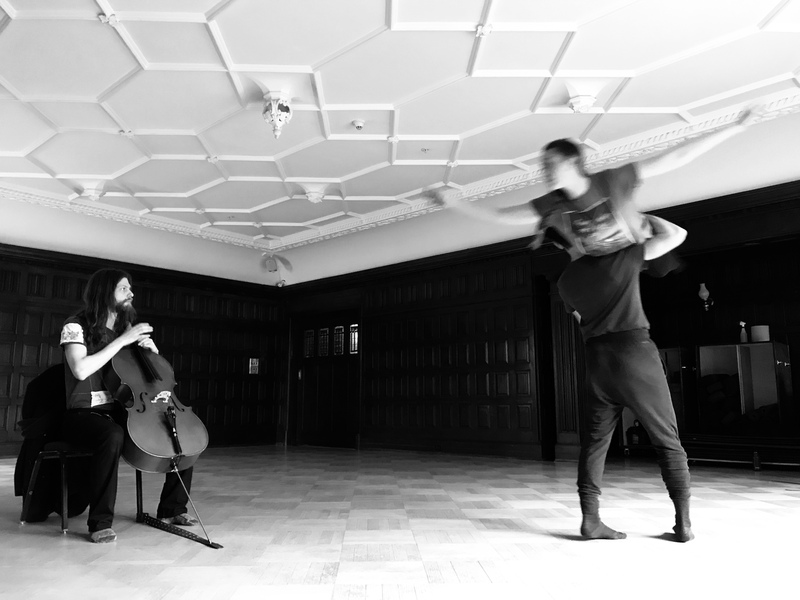 Martin Reisle is cellist and has composed and plays live the new score for Deep Roots. He’s on stage and playing solo for the entire concert and in one section he moves to a phonograph and puts a record on of singing birds that was recorded in a garden in 1927 and plays along. It is a mysterious and magical moment that is a nod to the tracing of timelines evident in the piece. Professional dancers include myself, Rachel Helten and Juan Villegas. We we began the creative process in January 2019 at Aberthau mansion/ West Point Grey Community Centre as Artists in Residence. Ezequial Peralta is Argentina based projection artist and he joined us later in the process to develop computer animations that will be projected on a blank canvas above the fireplace in the Oak Room where the performance takes place. Images include Linda’s letters, Chinese characters, family photos from the cast members and abstract graphics. 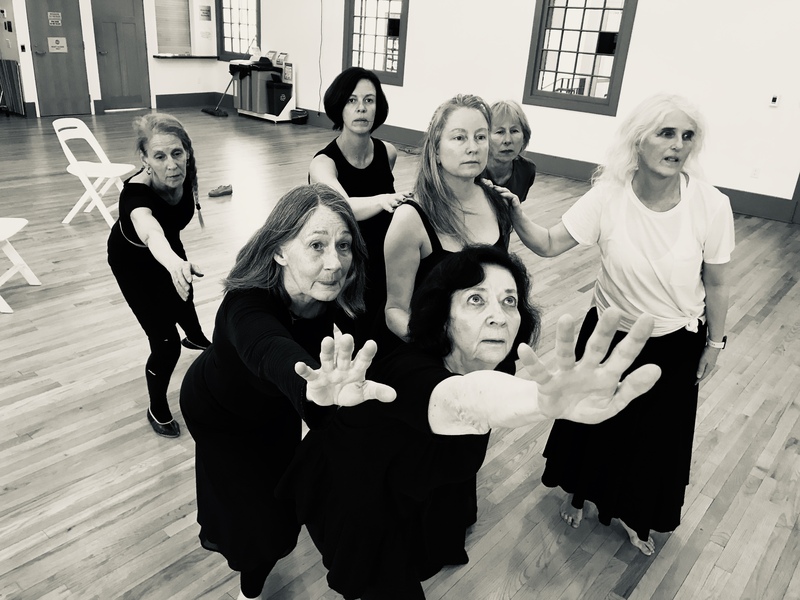 In the past year I have been offering older adults Martha Graham Modern Dance Technique and seven women from this workshop perform a section in the performance with the Graham vocabulary depicting the interconnection between generations past, present and future. The music is hauntingly beautiful with female toning vocals and cello. A tree is the perfect metaphor to begin to understand the importance of ancestral healing. A seed planted begins to grow downwards and upwards with new life sprouting from its branches- reaching for the light. It’s deep roots anchor into the earth drawing up nourishment so that the new buds may blossom. Should there be a drought or disease the entire ecosystem of the tree is effected and it fights for equilibrium once again. We are never doing anything alone. When we honour the ancestors and send healing to the past we bring new hope to all the generations. Dezza Dance presents Deep Roots on Friday, April 5th at 7:00pm and Saturday April 6th at 4:00pm at Aberthau Mansion/West Point Grey Community Centre (4397 W 2nd Avenue, Vancouver, Canada). Tickets are available online in advance for $25.00 or $30.00 at the door. The mission of Dezza Dance is to enhance connection, creativity and health through Contemporary Dance & Collaborative Creative Dance workshops, mentorship and events. Dezza Dance is committed to artistic excellence and innovation while creating safe spaces for artistic advancement in people of all ages.